If you are not particularly interested in buying an expandable hose and would prefer to own a conventional one, then this is the page for you. On this page are reviews of many different types of hose, so you should find one that tickles your fancy. You have decided to purchase a conventional hose pipe and you realise that because of their more complex construction they are associated with a more significant outlay than expandable hoses. A quality garden hose should last anywhere between 5 to 10 years, but if you make a poor choice you might be replacing your hose annually. Before asking the question of which hose is best to purchase, you need to ask yourself what duties you wish to accomplish with it. Is it simply washing the car, or do you want to put it to more regular tasks such as watering hanging baskets, watering the lawn and garden, or filling up the pool? This consideration is not rocket science. If you wish to permanently wall-mount your hose, you simply need to calculate the distance from the mount to the furthest place you wish to irrigate. Of course, hose pipes can even be connected together using the right type of hose accessory – there are many of them available. Hose diameters are 3/8-inch, 1/2-inch and 3/4-inch. The bigger the diameter, the more water is delivered. All the hoses on this page are of the 1/2-inch variety. With materials science improving all the time, hoses are becoming more and more durable, lightweight, tougher and able to handle temperature changes better. Most hoses have more than one layer and are also reinforced. This means that kinking and bursting are less likely to happen and handling is also easier. The hoses reviewed on this page are made of the most up-to-date materials, many of them more than one layer and reinforced. Do you want a wall mounted hose with auto-rewind and centrifugal braking technology, or are you happy with a compact portable hose you can carry around as needed? Only you can answer these questions, and you should consider them carefully before purchasing. The Hozelock starter hose is as it states essentially a very simple hardwearing hose with UV and frost protection and coming in at a very cheap price. It comes with a tap connector, a hose end connector, a waterstop connector and hose nozzle. Unfortunately, it does not come with a reel stand or hook, but these can be purchased separately. This hose has a special braided reinforcement technology which ensures that the structure of the hose is maintained, delivering water effectively to your garden. Overall, a very durable and popular hose which also can be purchased in a 15m length rather than the standard 30m. mount giving you maximum ease of use and watering joy. An amazing auto-reel system and a box which can be swivelled through 180 degrees both add to the sheer ergonomic design of this product. Inside the Gardena box you will find an adjustable spray nozzle, tap connectors and a standard hose connector with Gardena system fittings. It boasts a powerful even hose retraction system which utilises a built-in steel spring, adapted perfectly to the hose length. An integrated hose guide prevents the hose from kinking or tangling. The hose can also be purchased in 25m and 35m lengths. All-in-all, the Gardena hose pipe box comes at a premium price but also gives premium performance. This is another hose manufactured by the Hozelock company. This hose is more expensive than the Hozelock starter set as the hose is enclosed in a compact box. The box comes with a large winding handle for easy manual rewinding and a carry handle allowing the lightweight box to be full portable. There is also the option for the box to be wall mounted. The Hozelock 2 in 1 comes with 25m of Hozelock multi-purpose hose, a threaded tap Connector, hose end connectors and a nozzle. To summarise; this hose comes at an affordable price with great ease of use and leaves few purchasers dissatisfied. The VonHaus 20m garden hose is another hose concealed in a wall-mounted box with an auto-rewind action and 180-degree pivot. This hose is more medium priced when compared with the luxurious Gardena model. When you have finished watering your garden, a powerful spring automatically retracts the hose reel back into its tough plastic housing without any kinks or tangles or effort. Extending the hose is no problem – you just need to pull it. The hose locks into place when watering, so there is no need to keep it taut when watering. For a very reasonable price tag, the VonHaus model gives you a very versatile hose and gets very good reviews with very few exceptions. A modicum of DIY skills are needed to mount it to the wall. 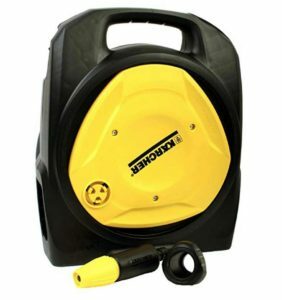 The Karcher hose reel with 25m PrinoFlex hose is a great looking hose pipe at a very reasonable price. It is a manual wind hose which is tough and robust and easily portable with its carry handle. 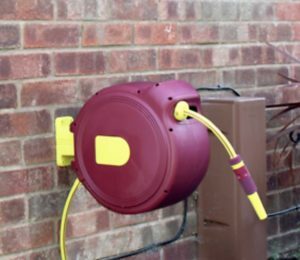 The reel can also be mounted on the wall for easy storage and it can also be used in its mounted state while doing your watering duties, whatever they may be. The stand is quite lightweight and some purchasers have noted that tugging on the hose while the reel is mounted on the wall makes it feel as if the stand is going to detach from the wall bracket – so perhaps this hose is best used from the ground. In summary, the Karcher 25m is reasonably priced and has great functionality. The Draper soaker hose is a hose designed to be laid permanently in your garden borders to irrigate your plants as you require. The hose is laid on or under the soil and water seeps through holes in the hose. This 15m hose is very inexpensive and is used in a very different way to the other hoses on this page. You need to ask yourself the question of whether a permanently laid hose is something that would suit your needs. It is possible for more than one Draper hose to be connected together but you must ensure that your water pressure is high enough. The Draper hose is a more specialised hose than most and it is supplied with two-way coupling and two 1/2-inch hose connectors, one with water stop. Overall, a durable hose with some great reviews and one that will not break the bank. The Karcher compact hose is a lightweight version of the regular Karcher hose. As the name suggests, this hose is a compact hose of 10m length and meant for small gardens and patio areas. The hose has the option of vein mounted on the wall, or it can just be used from the ground. This product comes with a 2 pattern spray gun, a water stop connector, a universal connector and a threaded tap connector. It is also compatible with the Karcher pressure washer. It is very lightweight at 2.7kg and can be carried around the garden with ease, but some users have noticed that the winding handle can be fiddly to use. A tough, durable, compact hose at a reasonable price with great feedback from purchasers.